Is Brighton v Fulham on TV, what time is kick-off, what are the odds? Brighton will be hoping to bounce back from their narrow defeat at Anfield last weekend when they take on Premier League new boys Fulham at the Amex on Saturday. Fulham recorded their first win of the season last week, beating Burnley 4-2 at Craven Cottage and then overcame Exeter 2-0 in the Carabao Cup in midweek. A much-changed Albion side exited the competition 1-0 at home to Southampton. What time does Brighton v Fulham kick off? Kick-off is at 3pm on Saturday. It is Albion’s last home 3pm kick-off until the end of October when they face Wolves. No. But the Seagulls' following two Premier League fixtures against Southampton and Tottenham will be screened on Sky Sports and BT Sport respectively. Midfielder Yves Bissouma shone against Liverpool and Southampton, so will hope to keep his place in the starting 11. 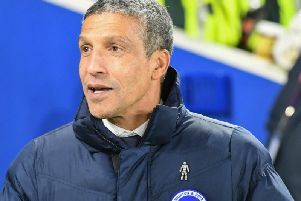 Fitness concerns remain around Lewis Dunk, Jose Izquierdo, Florin Andone and Bruno. Tom Cairney should be fit to play for Fulham, despite being substituted in the second half against Burnley. Tim Ream missed out for the Cottagers on Sunday and remains a doubt for their trip to the Amex. Lee Probert will be the man in the middle on Saturday. He oversaw the Bournemouth versus Everton game last weekend and brandished two red cards. His last game in charge of Albion was the 2-0 defeat at Leicester in August, 2017. Albion are favourites with SkyBet for the win, priced at 5/4, with Fulham 11/5 to win and 23/10 for the draw. Glenn Murray to score first is 4/1, followed by Pascal Gross at 11/2. Albion’s talismen are priced at 6/4 and 2/1 respectively to score at any time. Fulham’s in-form striker and ex-Albion transfer target Aleksandar Mitrovic is priced at 9/2 to be the first man on the scoresheet. A Murray hat trick would scoop £33 from a £1 stake.